Simply Skinny® Hydr8+ weight loss powder instant drink mix in Grab & Go Single packs. 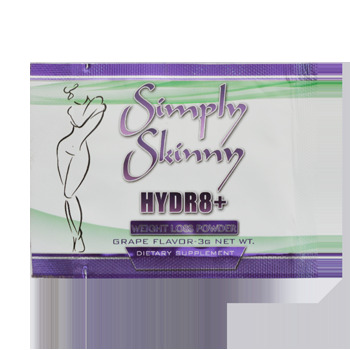 Simply Skinny Hydr8+ weight loss powder is a delicious grape flavor powder dietary supplement - just add water and drink! Our exclusive, innovative formula is designed to keep you hydrated while helping you shed unwanted pounds burning unwanted fat effortlessly. Simply Skinny® Hydr8+ can also serve as a replacement for soda, fruit flavored drinks and caffeinated beverages.